After not having any success seeing the Northern Lights in Lapland last year we instantly decided that we would try again this year. I always like to travel to new places rather than going back to the same place again so I soon decided on Norway for our Winter holiday and Tromso as our destination for exploring. One thing we really regretted in Lapland was not hiring a car as we felt solely dependent on the tours which was pretty limiting and very expensive (approx £150 each). This time hiring a car was a priority as we really wanted the freedom to be able to drive around to different points at night to try to see the lights for ourselves. This definitely paid off as we were lucky enough to witness the aurora on our very first night at the first location we drove to - Telegrafbukta Beach. It was such a surreal and exciting experience! They weren’t very strong this night but to get this photo was a dream come true. There were other people on the beach watching too and to hear them scream and cry just made it all the more exciting! We also happened to see them again on our second night and after driving out of town and into the fjords. Again, it wasn’t the strongest of sightings but we felt very lucky to have seen them two nights in a row. These shots were taken about half an hour out of Tromsø in Kaldfjord. On our third night we decided to book a tour through Wondering Owl. I think by this point we were desperate to see a really strong display and felt that a planned tour would give us the best shot. I’m so glad we made this decision because it really paid off! On this night we got an even brighter display than we’d ever seen before and the photos were just incredible. Our tour guide was very knowledgeable and he took us to a really beautiful location - a beach about an hour out of town near Laksvatn. I have never seen such a clear and star filled sky in my entire life. That alone was quite something! Even the guide seemed impressed to have found such clear skies without having to travel further inland. We spent some time setting up our camp for the evening and getting our cameras ready. We didn’t have to wait very long until the aurora made its appearance and we were able to get some really beautiful shots. After this initial display we sat around the campfire talking and sharing stories. The guide gave out some bread and soup and we tried to warm up as best we could. Definitely the most challenging aspect of this trip was the waiting in the cold. I think it was about -5 but the longer we were there the colder I felt. I think at one point I began to lose feeling in my toes despite being given some sturdy boots by the tour operator! Sadly the lights didn’t really show strongly again after that initial display but we were more than happy with what we had seen and the photos we had taken. It really was a night to remember! 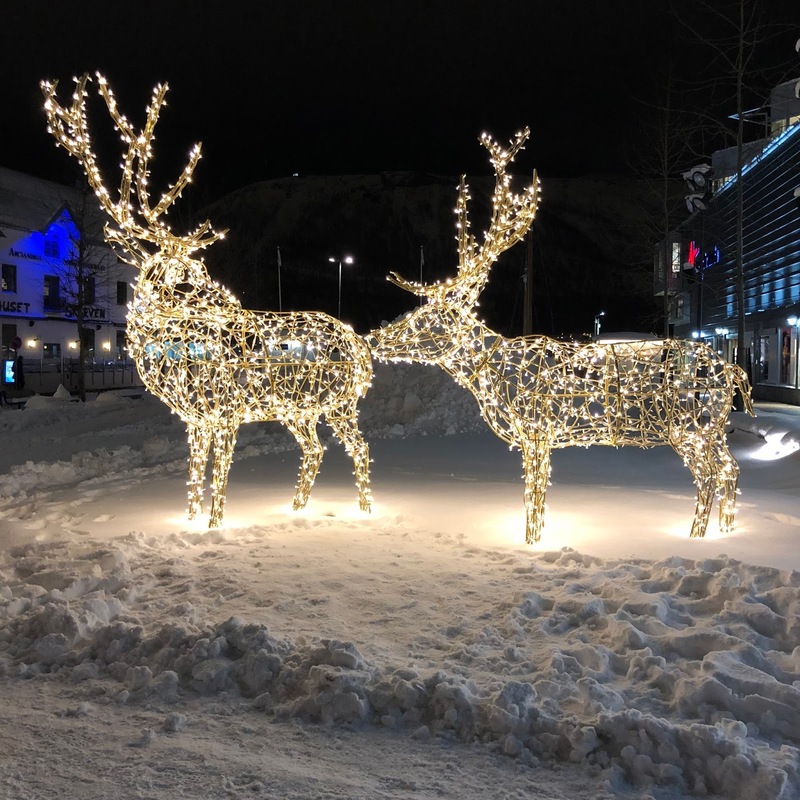 On our last day in Tromsø we decided to book an excursion with Tromsø Arctic Reindeer after having seen some of their amazing photographs on Instagram. We had seen reindeers whilst in Lapland but didn’t really have a chance to get up close to them. This tour gave us an opportunity to feed the reindeers and learn more about the Sami’s who look after them and their culture. Again I’m so glad we made a fairly last minute decision to go on this trip as it really was so much fun and so great to get up close to the reindeers. We spent about an hour feeding the reindeers and taking photographs and then we were served up lunch. We had the option of vegetable stew thankfully as the alternative option was reindeer stew. We then all sat around a fire and a member of the Sami family talked to us about their culture and how they care for the reindeers. I’m obviously super picky about any excursion we do that involves animals and I’d never take part in anything exploitative. I was really happy to see how much freedom these reindeers have and how well the Sami people take care of them. It was also good to hear how they’re released into the wild at certain points of the year. The Sami people have faced some very difficult times in the past and have not always been accepted by the Norwegian people but thankfully now times have changed. They make their living from the reindeers which in turn enables their culture and way of life to stay alive. All in all it was a fantastic experience and I’d really recommend booking with Tromsø Arctic Reindeer and visiting this camp. During our time in Tromsø we stayed at the Clarion Hotel The Edge and it was the perfect choice being central and having excellent views across the water. Our room and bed were so incredibly comfortable and it had everything we needed. Breakfast was also ok and I managed to enjoy some beans on toast and fruit salad. I found myself having to pick sausages out of the potato dish too which was annoying but the longer we stayed in Tromsø the more I realised that they like to put meat in almost everything! Being vegan in Tromsø was certainly a challenge and on a couple of occasions I needed to be flexible and switch to vegetarian food. Sadly for me I actually encountered some rudeness from staff at certain establishments when trying to convey what I wanted. It was almost as if they just didn't have time for it and what you see in the coffee shops is what you get. It was frustrating at times especially when freezing cold and really hungry. That being said I did have a couple of good experiences too. 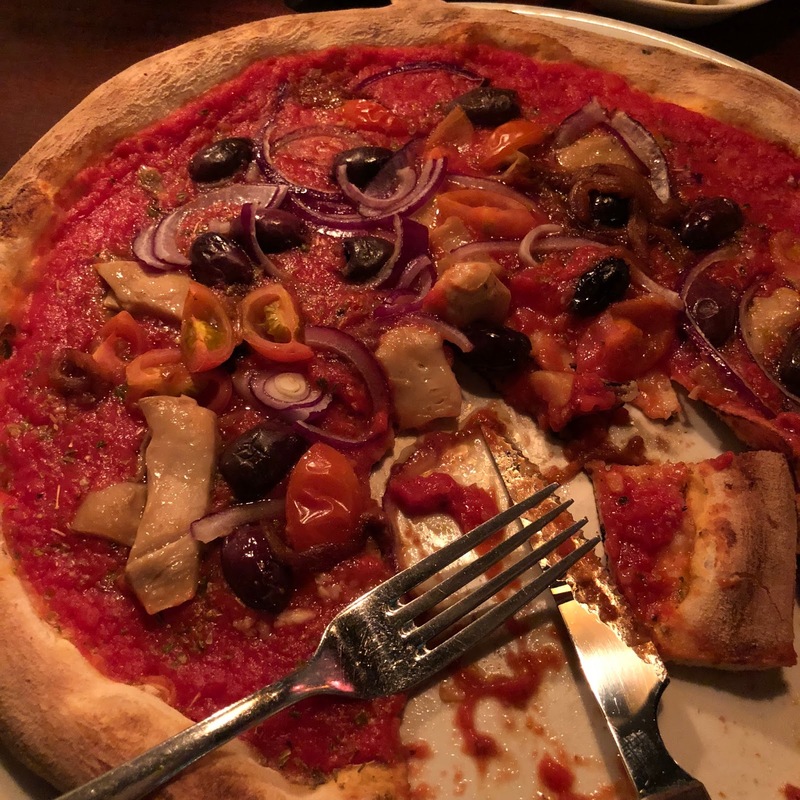 One night we went to Casa Inferno and they were very accommodating and made me a great vegan pizza. We also went to Burgr for dinner one evening and they had a great falafel burger on the menu and really tasty fries and onion rings. The evening we went on the Northern Lights tour we were able to pick a vegan soup option which was homemade and super nice. We also enjoyed a nice vegetable soup on the reindeer tour too. It was dark pretty much the whole time we were in Tromsø which was quite an experience in itself. The sun set at midday and rose again at 01:00 in the morning. But we didn’t even see the sun, instead everything just looked grey/white and driving around felt like we were in a black and white photo. I think there was only one day where we saw some blue sky and the pink colours of a sunset. I would have quite liked to have done a whale watching tour but as I suffer with sea sickness I avoid boats like the plague. But if your sea legs are better than mine this would be well worth checking out. We did make time to visit the Arctic Cathedral which is a really interesting piece of architecture and worth a short visit if you have the time. This whole trip was such an incredible experience and something I’ll always remember. It feels great to be able to say that I’ve seen the Northern Lights and to be able to tick this off my bucket list! It was unforgettable and I don’t usually like returning to the same place again on holiday but I think it’s safe to say we’ll be going back again. I’d love to experience the fjords and the scenery during the Summer time as the photos I’ve seen look so beautiful and it looks like a completely different place and experience to visit at that time of year. Although I believe the only time you can see the Northern Lights is between October - April so bear that in mind when planning your trip. Hire a car for your stay. We always hire cars on holidays and I can appreciate that it can be daunting for those who have never done it before but trust me when I say it gives you so much more freedom to do and see more. Having a car meant we could pop out every night to try to see the Northern Lights for ourselves and on our own time frame. Just beware - if you hire an electric car like us it may not have enough range to drive you far out of town. Plus charging points seemed to be in very limited supply. The places we had success at seeing the Northern Lights were Telegrafbukta Beach, Kaldfjord and Laksvatn. Book a tour. Yes they’re expensive but they’re worth it. We wasn’t sure if we were going to book a Northern Lights tour as we had a car but it’s fair to say that the tours go above and beyond to try to give you the best possible chance of seeing the lights. Some travelling as far as the Finnish border! Stay for at least 4-5 nights in order to give yourself the best chance of seeing the Northern Lights. Tromsø is just as expensive as the rest of Norway so I’d recommend trying to have breakfast later and filling yourself up so you can skip lunch and then just pay for dinner in the evening. Make sure you pack lots of layers including thermals and thick socks, especially if you're planning on trying to see the Northern Lights. There will be lots of waiting around in the cold for potentially hours so go prepared. And just for your info we booked our London to Oslo flight with Ryanair from Stansted Airport and from Oslo we flew with Norwegian Air on to Tromsø. It looks like you had an amazing trip, and I'm so glad you got to see the lights! My Mum and I went to Iceland last year and saw them there, and it was a really special experience to finally see them, especially with my Mum who got me obsessed with them in the first place. How did you find driving a car in Tromso? I'm always unsure about what it's like driving in the snow since I've not really done it in the UK let alone a country where they have quite a bit of snow. Your trip looks amazing. I saw the Northern lights in Iceland once, but not as clear as that.